911 Three Lakes Road...your Emergency Get Away! Cozy two bedroom cabin surrounded by pine trees on one acre of land. There is a full kitchen with all utensils and cookware you need. There is a fish cleaning shack behind the cabin (bring your own filet knives). If you trailer your boat and fish on the several different lakes all within minutes of the cabin, this is the rental for you. Ottertail Lake boat launch is five minutes away. Sit out on the deck and listen to the loons while enjoying your morning coffee. Tiki torches light up the deck for a relaxing evening. The fire pit is perfect for evening bonfires. Both bedrooms have a queen size bed, and queen size mattress can be put in living area for a cozy stay for 6. There are two televisions with local channels. If it is raining, sit in the cabin and enjoy a variety of movies or play some card games, Farkle or Boggle. There are a couple of yard games located in the fish cleaning shack as well. There is a full size tub and shower. Linens and toilet paper provided. Donald's Lake as well as Portage and Long Lake are located within the Three Lakes Retreat area. Paved roads make this a perfect area for morning or evening walks with your dog. My wife and I had been visiting the Ottertail area for over 15 years and we loved the area. For our 20th Wedding Anniversary we purchased this cabin and updated it. The Ottertail area offers so many different lakes within 20 minutes of the cabin. Ranging from Ottertail Lake to some small gems like Pelican Bay. There's a lake for every ones liking. Many unique shops also in the area for all those things you never new you needed! It is so quiet and peaceful out in the Three Lakes Retreat area. The kids will have room to roam outdoors. Enjoyed the cabin, nice trip. This cabin was wonderful. It is beautifully remodeled and CLEAN! It was the perfect place for us to stay while in town visiting family. We took advantage of the yard games and fish cleaning amenities while there. This cabin really has everything you could need while away from home. So happy with our choice here, exactly what the owner described. 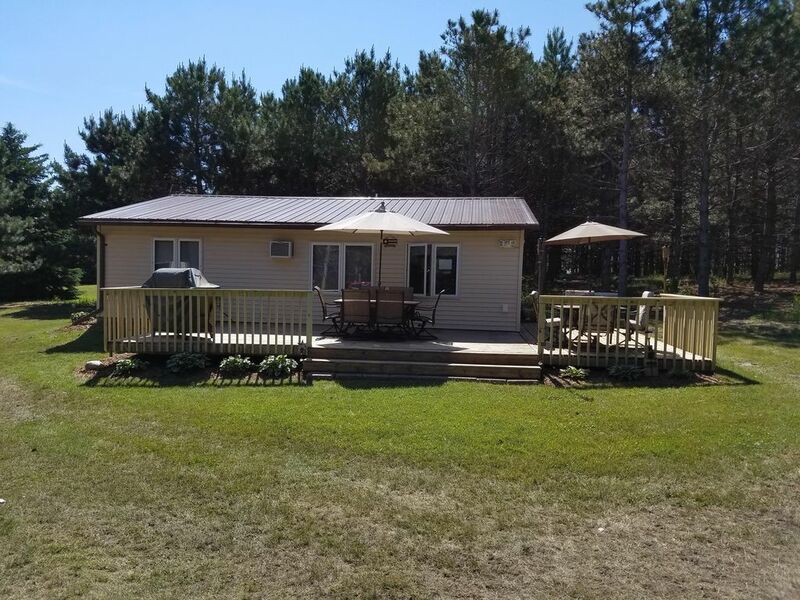 All the comforts of home in the Great Ottertail area! Room to relax inside with comfortable furniture,nice tv’s and stereo. A/C and ceiling fans ,Full kitchen and pizza oven! We did a lot of fishing in the area and put the personal fish cleaning house to use! There is outdoor power to charge your boat batteries too! I can’t say how much we love the area and can’t wait to book our next rental at this amazing, comfortable and awesome Cabin. You can tell the onwers work hard at making sure the guests have everything they need. I just can’t say enough good things. We had a wonderful time at the awesome cabin and area. Can’t wait to go back. Fishing was the best part with the cabin offering all the extras to help make a great trip. Line I said we can’t wait to go back. A must is go to Battle lake for the nachos offered by the Rusty Nail they are the best! The Williams Company on Main Street in Ottertail is one of our favorite places to shop.